Hi Team Stryker fans! First off, so so sorry for the (very) late post. As some of you may know I’ve just started a new (non Team Stryker) job that required me to move. For the past couple of weeks I’ve been working a new full time job while also trying to move, two of the most stressful things in life in my mind. I haven’t gotten internet set up in my house yet so my only way online is either on my horrible work laptop or by sneaking bits of internet from my neighbor. By next week Team Stryker should be running smoothly again. Today is going to be a double-dip of Team Stryker goodness as I’m bringing you the pencils to Mission 004 Page 01 as well as the finished page of 02. 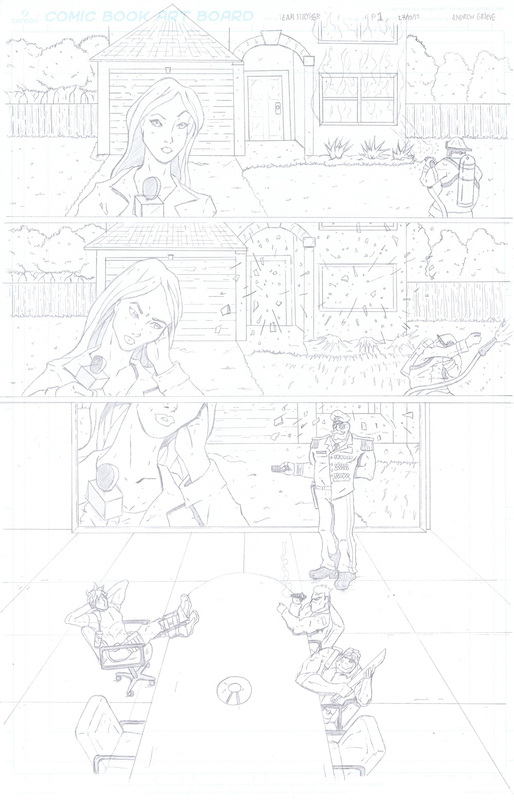 To start here are the pencils to Team Stryker Mission 004 Page 01 is their uncensored glory. This was the first page I drew for Mission 004 and it was quite nerve racking as I wanted to make sure that everything about Mission 004 was superior to all previous issues. I never want to go backwards in the quality, whether it be in the writing, drawing, coloring or anything else. I want Team Stryker to improve with every page so you, my amazing readers, always have a reason to come back. Early on in the writing process I knew I wanted to open up with a news report and use that as a way to transition to Team Stryker getting their first on-page briefing. I wanted to show that, while we hadn’t seen them before, Team Stryker has to be briefed before any mission they embark on. These briefings are perfect for giving story information in a fast paced manor so we can get to the good stuff faster. General Strongbottom went through several design changes over the course of a couple months. I hadn’t fully designed him until a week or so before I started drawing the issue. There are so many amazing commanders in comics and cartoons that it’s hard to create someone entirely different to fill the same basic role. I wanted Strongbottom to be cliche enough so that it’s funny but original enough that he is his own character. You’ll be seeing Strongbottom a lot in the coming pages and issues. Sorry again for the delay and thank you for your understanding. Stay tuned as page 02 is just around the corner.